Well, looks like I lucked out and got in a few more snow rides. Six snow rides in ten days is pretty good, I'll take that any day, especially considering the lack of snow fall we've had this season. Saturday was one of those days that things just fell into place. Slacking a bit, I didn't make any ride plans for Saturday, just decided to go with the flow, figured I'd hit it up solo. 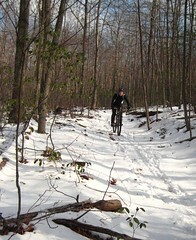 An early morning call from Jim for a trail report yielded some trail companions making the trek north. Hooked up with Jim and Keith for some snow riding goodness. Trails were great, a few more riders had been through and things were getting packed nicely. 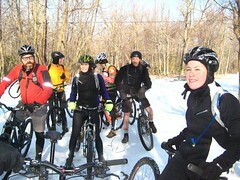 Sunday continued, this time with 14 other riders coming out for a ride Becky put together. Much fun was had rolling on the white stuff again. 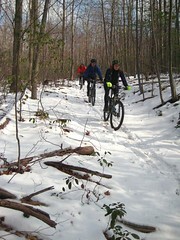 Lots of good people and the trails were pretty much perfect with the temps a bit warmer than Saturday. 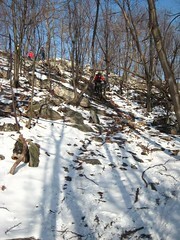 Traction on the packed snow was perfect for climbing and the barely touched downhill was like skiing on two wheels. Warm temps and a bunch of rain washed the snow dreams away but things firmed up with cold temps on Wednesday night and allowed a couple of us to rip some singletrack under clear skies and bright stars. Laid it down nicely coming through an "S" turn on the forest road that was covered in ice. Got sideways and couldn't recover until both wheels went out and I was sliding and gliding down icy washboard that left a few marks. Took a minute to arrest myself at that speed but man do you feel alive when you take the high speed dive. Good stuff boys and girls.